In this page we will look at the Octopus. 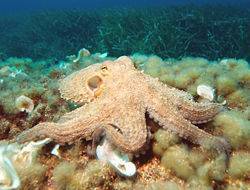 Is an octopus smarter than a fifth grader? We don’t really know, but octopuses are highly intelligent, probably more intelligent than any other order of invertebrates. The exact extent of their intelligence and learning capability is much debated among biologists, but maze and problem-solving experiments have shown that they do have both short- and long-term memory. Octopuses have three hearts. Two pump blood through each of the two gills, while the third pumps blood through the body. Octopus blood contains the copper-rich protein hemocyanin for transporting oxygen. This gives the blood a blue color. They have neither a protective outer shell like the nautilus, nor any kind of an internal shell or bones, like cuttlefish or squids. A beak, similar in shape to a parrot's beak, is the only hard part of their body. This lack of solid parts enables them to squeeze through very narrow slits between underwater rocks, which is helpful when they are fleeing from morays or other predatory fish. When under attack, some octopuses can detach their own limbs, similar to the way skinks and other lizards detach their tails. The crawling arm serves as a distraction to would-be predators; this ability is also used in mating. This video shows the amazing feats of the octopus.